You know his face. Everyone does. He's a veteran character actor whose resume includes TV appearances on Oz, Law & Order and The Closer, along with movies such as Spider-Man, Juno and the upcoming big-budget superhero flick Justice League. And since he won the Oscar last year for his portrayal of a relentless music teacher in the indie drama Whiplash, you may even know his name now. 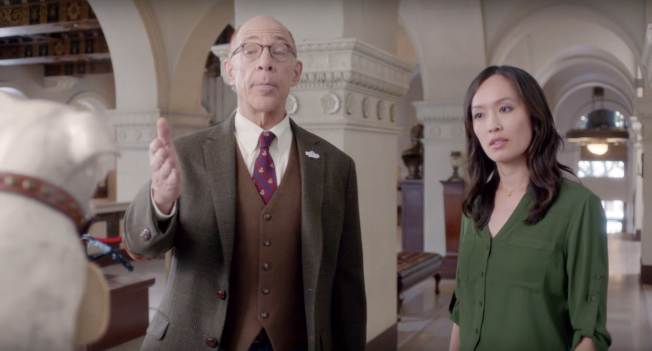 Though J.K. Simmons, Midwestern-born and musical-theater trained, has been ubiquitous in popular entertainment, he's kept his advertising portfolio intentionally slim. 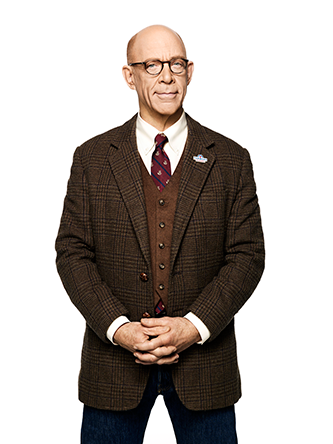 That's one of many reasons Farmers Insurance chose him to play the tweedy Prof. Nathaniel Burke in the ongoing campaign "We Know From Experience," in which he recounts stranger-than-fiction claims based on real tales of woe from policyholders. "He's not spread too thin," said Leesa Eichberger, the company's head of brand and sponsorships. "[His work on the campaign] makes it interesting and witty and funny without being slapstick." Simmons—whose booming baritone is everywhere from Kung Fu Panda 3 and Zootopia to Archer and the yellow M&M—stars in a handful of new Farmers spots from agency RPA that began rolling out during Olympics coverage this week. He spoke with Adweek from the downtown L.A. set, a historic former bank building that doubles as the Farmers Hall of Claims, about his aversion to shilling despite family ties to the business, his post-Academy Award life and his newly ripped physique (he nearly broke the internet earlier this year with his muscle-bound workout shots). Adweek: How did you decide, six years ago, to play the professor in the Farmers Insurance ads? J.K. Simmons: It's a character, so I'm not a pitchman in the traditional sense. I'd always had the concern that being in commercials would affect my credibility when I was getting started as a TV and film actor. I'd never done anything other than voiceovers until this part came along. I like the tone of this campaign and its cleverness. It felt like something that would not be harmful to a legitimate career but a delightful thing to be a part of. Does that mean you'll pop up in more ads? I don't see myself pursuing other commercial opportunities, no. This will probably be my only experience in this world. Outside of your longstanding gig as the voice of the yellow M&M, you mean? That's such a fun, loveable character, and I've been doing it for 20 years now. I always say it's the sweetest job I've ever had. There is some advertising in the blood, though? My uncle worked at Grey Advertising years ago on the Revlon account, and I lived with him and my aunt when I first moved to New York to do theater. My aunt was so attuned to commercials that she could always identify the voiceover actor. Now it's doubly odd to be that guy that people recognize from voiceover work. Is there any difference in creating an ad character as opposed to a TV, film or stage character? The basic process is similar, and it's always a collaboration. In this case, it's not just between the director and me. It's also the ad agency and the client. But once we established who this guy was—he's the very wise voice of experience—we've all been on the same page. What impact did winning the Oscar have on your career? The sheer number of offers coming my way is the most obvious. And the best benefit might be that between the Farmers Insurance work and the film offers, I'm now realizing that it's really OK for me not to work all the time. It's OK to turn down stuff that isn't really interesting and spend the summer with my family. And another big change is that producers have been willing to shift projects to L.A. because that's what works for me. I like to stay home. I don't want to be away shooting in Europe for six or eight months at a stretch.